OUR HORNS ARE THE ONLY AIR HORNS on the market with a removable end caps for cleaning, maintenance, or replacement of our diaphram. If dirt gets inside your horn, it will prevent the diaphram from vibrating and will interfere with the sound from your horn, no air no horn. 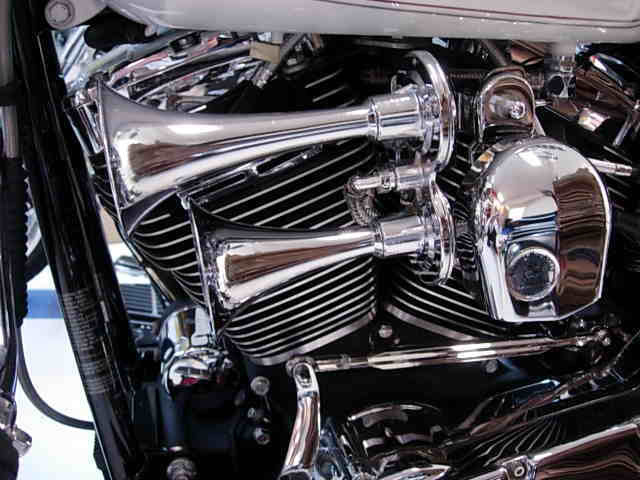 Some foreign made horns have a crimped plastic or pot metal back disguised by a chrome cover that cannot be removed for cleaning so whatever gets in your horn, stays in your horn. Next time you are on the road, look at the truck horns and you will see that they also have a removeable sound unit for maintenance(a standard in the Marine and Trucking industry). HOWARD'S HORNS ARE ALL METAL AND CONTAIN NO TIN COMPONENTS. Remodeling our website, call for ordering. 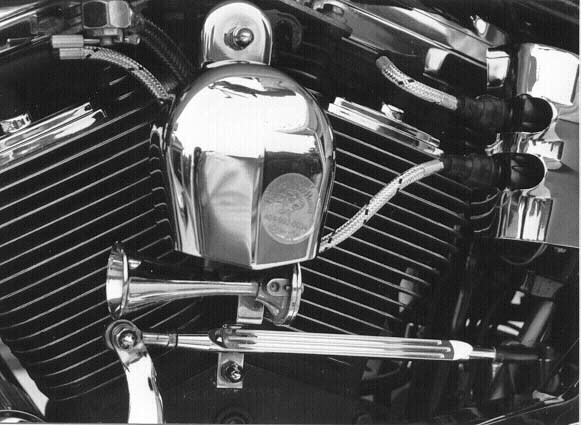 We do NOT have any more Dual Horns for Rubber Mounted Engines: Ultra, Road King... until end of September because of Sturgis Bike Week and back orders. 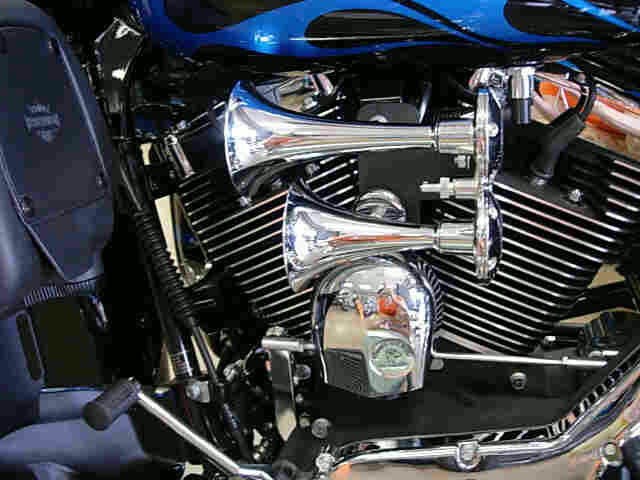 ONLY Dual Horns available are the louder, deeper tones for Softails ONLY: Fat Boys, Heritages - MUST call, 30% off sale for Sturgis, while supplies last!! Little Big Horns are on sale for up to 60% off, supplies are limited, call 770-992-0034 for info. Before you call us for help, please PRINT our TechTips and Install Instructions and run through all our tips while you are at your bike. Chances are, you will figure out what you need to do and save yourself a call. LITTLE BIG HORN: call for info, supplies are very limited. Sorry, DYNAMIC DUO WILL NOT FIT Evo engines before 1992 unless petcock has been moved to back of tanks. These bad boys are extremely loud on SUVs, Pick-ups, Hot Rods, the full size car/truck battery makes a huge difference! More electricity=more sound. Don't forget to order a pair of NOSE CONE DIRT GUARDS to protect trumpet opening from dirt, and bugs. For EFI Ultras with Fairing Lowers ONLY!! Will NOT fit 2017 Ultras or Milwaukee 8 engines. Protects front openings of Dynamic Duo Horns from rain, dirt, and bugs. Protects front opening of horn from rain, dirt, and bugs. WE ARE SIMPLY THE BEST!!!!!! 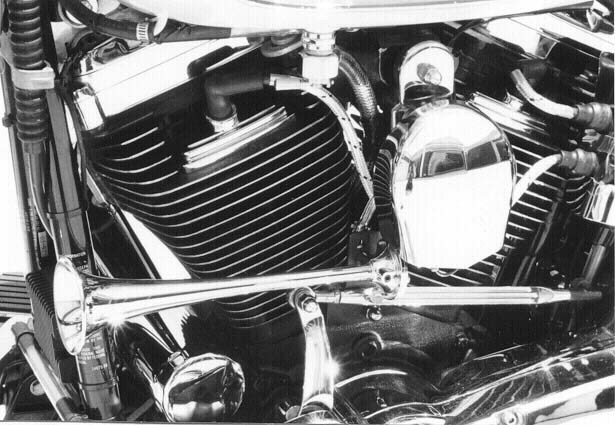 ACOUSTICAL ENGINEER'S REPORT DATED 7/6/94, TESTED STOCK HARLEY DAVIDSON HORN VS. HOWARD'S HORN. Our quality product is in use by many Police Departments, Shriners, Patriot Guard, and Blue Knights. Before you call us for help, please PRINT our TechTips and run through all our tips while you are at your bike. Chances are, you will figure out what you need to do and save yourself a call. Please send E-mail to Howard's Horns at sales@howardshorns.com Emails with blank subject line may not be read.